An occupational therapy aide (OT Aide) prepares materials and equipment for occupational therapists (OTs) and assistants (OTAs). He or she also helps patients get to and from treatment rooms. Occupational therapy involves rehabilitating individuals who have lost their ability to perform activities of daily living due to an illness, injury, or disability. An OT aide may also perform clerical duties such as answering phones, scheduling appointments, and filing patient records. Unlike an occupational therapist or an occupational therapy assistant, an OT aide does not provide direct patient care, but he or she helps facilitate treatment by providing support for those who do. They earned a median annual salary of $28,330 or $13.62 per hour in 2016. In 2014, approximately 9,000 people were employed in this occupation. Most worked in occupational therapists' offices, nursing care facilities, and hospitals. Employment is expected to grow much faster than the average for all occupations through 2024. The U.S. Bureau of Labor Statistics has declared occupational therapy assistant a "Bright Outlook" career because of its excellent job outlook. To get an entry-level position, you will need just a high school or equivalency diploma. Your employer will provide on-the-job training that will last from a few days to a few weeks. You will learn how to set up equipment and keep treatment rooms germ-free. Active Listening: Strong listening skills will allow you to understand, and therefore, follow instructions from occupational therapists and assistants. It will also help you care for your patients. Verbal Communication: You must be able to clearly convey information to your colleagues and patients. Interpersonal Skills: In addition to excellent listening and speaking skills, you must be able to understand non-verbal cues, coordinate your actions with others, and show empathy and sympathy. Service Orientation: You must have a desire to help people. Detail Oriented: Attention to detail is imperative, especially when it comes to following therapists' instructions, keeping treatment rooms clean and tidy, and helping patients complete forms. "Assist staff occupational therapists in their treatment of assigned patients"
"Prepare the treatment area, patient, and equipment for treatment"
"Maintain a safe, clean environment"
"Perform ongoing inventory of equipment and materials to ensure adequate supply. Notifies department manager of ordering needs"
"Participates in all infection control, departmental equipment training, organizational safety, and fire safety programs"
OT aides and assistants differ from one another significantly regarding their educational requirements and job duties. OT aides need only a high school or equivalency diploma while OT assistants must earn an associate degree from an accredited training program. Assistants must be licensed or registered by the state in which they want to work. There is no such requirement for aides. Occupational therapist assistants help patients do therapeutic activities under an occupational therapist's supervision. 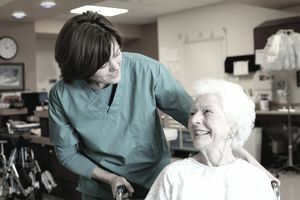 OT aides' are responsible only for tasks that are indirectly related to patient care. "Must maintain confidentiality of all proprietary and/or confidential information"
"Able to lift, transfer, and guard patients safely with appropriate assistance without likelihood of injury to the patient or oneself"
"Excellent communication (both oral and written) skills"
"Must have basic computer and office equipment experience"
"Capable of following standard procedures and detailed instructions"
"Knowledge of basic medical terminology desirable"
Take this quiz to find out if you should become an occupational therapy aide. Bureau of Labor Statistics, U.S. Department of Labor, Occupational Outlook Handbook, 2016-17 (visited September 11, 2017). Employment and Training Administration, U.S. Department of Labor, O*NET Online (visited September 11, 2017).